It's been a while since the last blog. I was away for a couple of weeks so I don't know exactly what happened but I hear people still managed to turn up and partake in board gaming without me so all is good in the world of IpBoG. 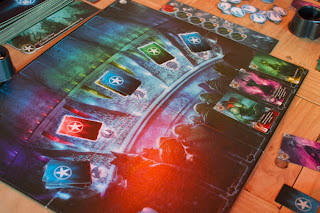 Last week I went straight to Cult from work so didn't have my camera with me and, as has been mentioned many times before, no one wants a blog without pictures so I've saved up two weeks of excitement into one double packed blog post. 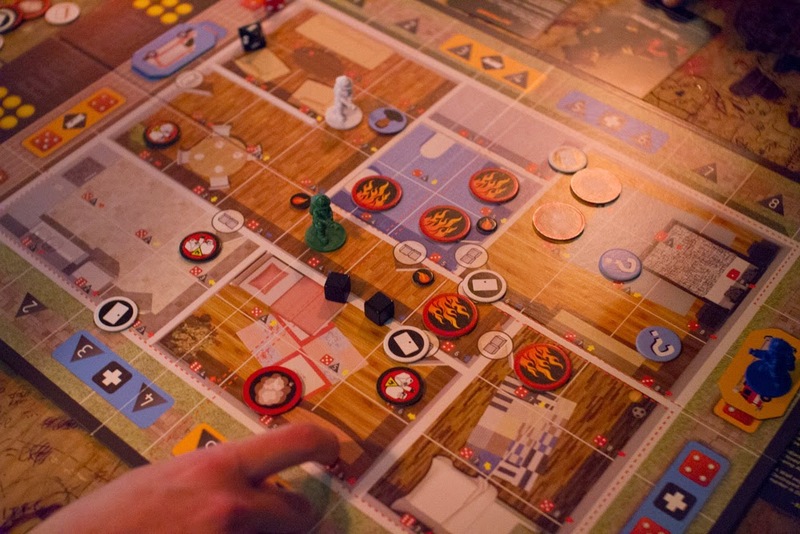 The big new game this week was Flash Point: Fire Rescue, a cooperative game about, you guessed it, fighting fires. We found out pretty early on that having a specialist in the fire engine really helped keep the fires under control. This left the other players free to mostly ignore the fires and rescue the people. The paramedic helped revive the people and get them to safety quicker. My job, it seemed, was to get the people the last few meters to safety, stealing all the glory. Functioning like a well oiled machine we were keeping well on top of everything. The thing about well oiled machines is they're kind of boring, no one enjoys being a cog. Towards the end, in an act of heroic defiance, Andy left his post on the fire engine to break down a well and save a couple of people. This was all good, the people were brought to safety, but we'd let a rampant fire get out of control near another character; the family dog! But ever a member of New York's Bravest, Andy chopped down another wall with his axe (walls are often made of wood in America for reasons I've never understood, so I assume this is vaguely possible), braved the inferno of a room, and took the dog to safety, winning the game by rescuing our seventh character. I also played Abyss where everyone told me I'd got the rule wrong about the monster track but I insisted I hadn't. In hindsight I almost defiantly had. Felixstowe Dan played a stellar first game and won by a long shot. 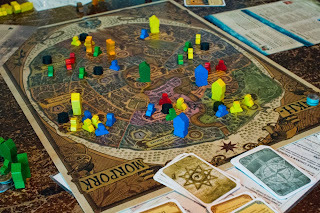 Some guys played Discworld: Ankh-Morpork. There were also the common staples of IpBoG: The Resistance, Coup, Skull and No Thanks! I doubt there's a week that goes by where at least one of those games isn't played. I'm sure I've missed a bunch of other games but some weeks it's hard to keep track. I've written quite a lot and not proof read anything so let's hope some of this makes sense! I hear it's bank holiday next week so some people might be turning up an hour or two early. Keep and eye on the Facebook group for more details.